Several months ago I was introduced to the term “Cli-Fi.” This breezy abbreviation refers to a subgenre of speculative fiction that tells stories of the world after climate change. BookRiot included several recommended titles in their article about Cli-Fi, several of which we have reviewed on Scintilla. James Bradley’s Clade may be the best one of the group. Clade starts on the summer solstice in Antarctica, where a young scientist is studying the effects of climate change. Adam is also worried about his partner, Ellie, who is home in Sydney awaiting the results of IVF treatment. The book then follows their lives for several decades, from their daughter’s arrival to the dissolution of their own relationship, the loss of Ellie’s father, the challenges of parenting and grandparenting, until finally ending on another summer solstice many years later. First, the novel itself is very poignant. Bradley never forgets the people he is writing about. Adam and Ellie are people who hurt, and in their pain they cannot help but hurt others. They each recognize the pain within themselves, and they see the pain in others, but they cannot break through their own suffering to give peace to anyone else. When they are sad, they lash out. When they are frightened, they lash out. This hurt extends through all of their relationships: Ellie’s father and stepmother, Adam and Ellie’s daughter Summer, their grandson Noah. Regardless of the science fiction or the trauma that is in their world, the human story that carries the novel is achingly real. Hypothetically, in a peaceful world with a stable climate and amazing resources, Adam and Ellie might have been able to get therapy and move into some healthier relationships. That is not the world they live in. Their world is collapsing. Fires and floods, monster hurricanes that virtually wipe out England, riots and government collapses, pandemics. Entire countries lost to encroaching seas. Their personal stories are set on a planet that is roiling and has no time for their personal problems. One interesting speculation Bradley makes in building his world is that the removal of the weight from ice sheets from tectonic plates would cause them to shift, adding earthquakes and volcanoes to the challenges facing the planet. Previous mass extinction events have shown both climate change and seismic/volcanic activity in correlation, though there is no way right now to prove cause and effect (or which way that may tilt), but it does add another layer of complexity to the challenges facing the survivors of this world. 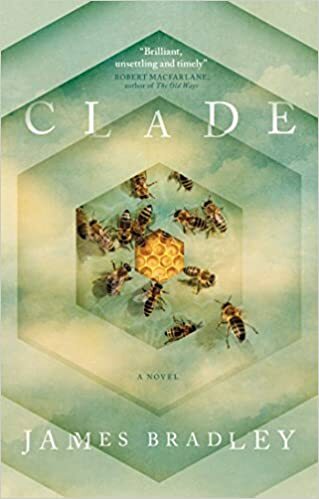 Clade is a novel worth reading if you like compelling human stories with very real-feeling characters. There are no heroes here, only survivors. But it is also a novel worth reading if you are interested in science fiction, “cli-fi,” or just want a good book to get lost in. I made the mistake of starting it when I went to bed. I could not put it down until I finished it. Clade is a book I highly recommend.